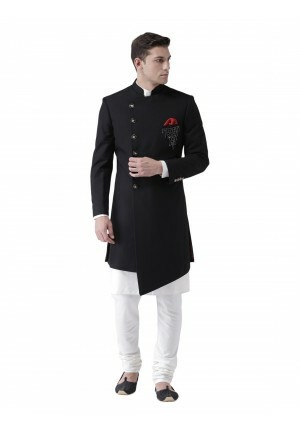 The Indo Western is a fusion of the best of ethnic & western wear. 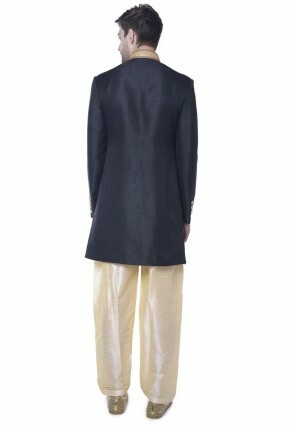 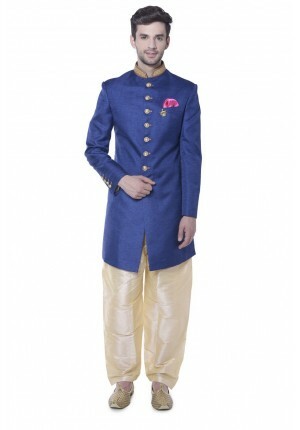 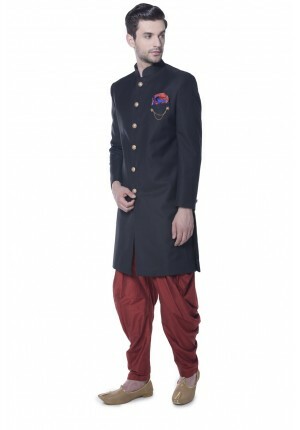 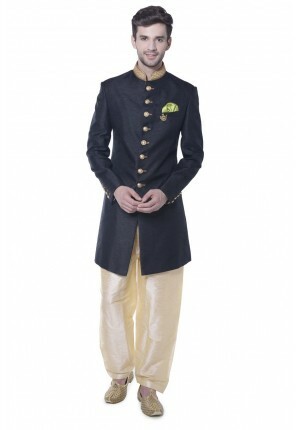 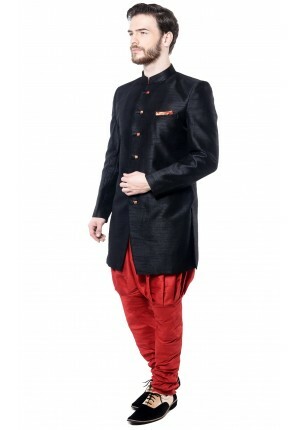 It is comparatively shorter than the traditional Sherwani and made of more rich, lighter and finer fabric. 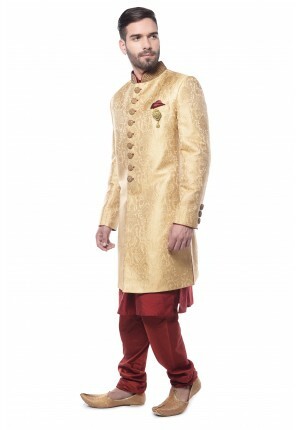 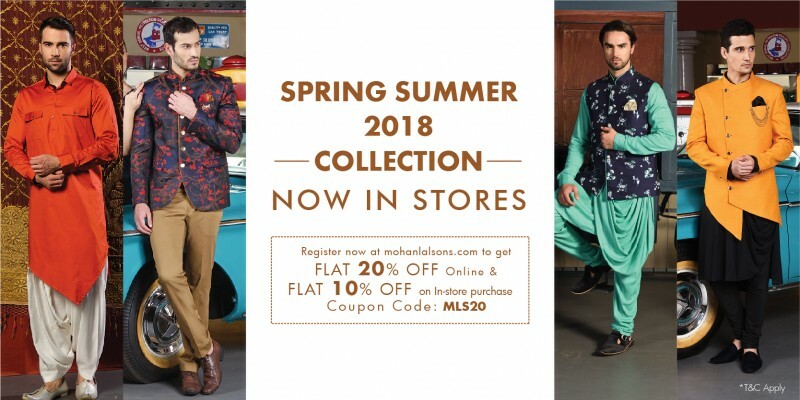 If you are looking to wear something classy and modern, Indo Western is a great choice for groom as well as his friends and family. 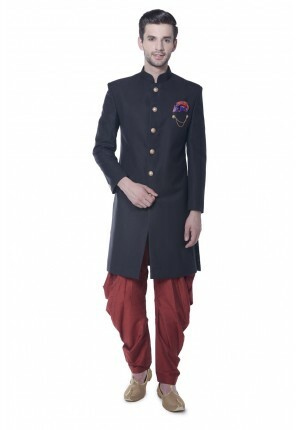 You can style your Indo Western with Dhoti, Patiala Salwar, Breeches, Trousers or Churidar to create a traditional and suave impression. 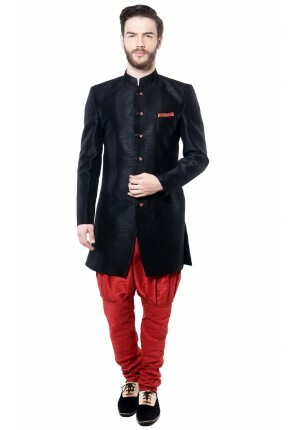 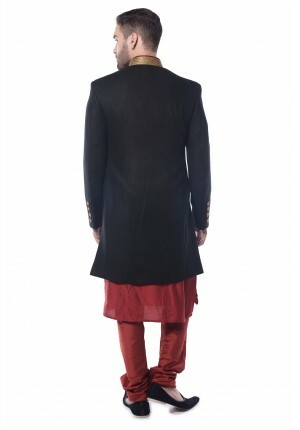 This angrakha black indowestern made out of suiting fabric with matching black buttons and chain des.. 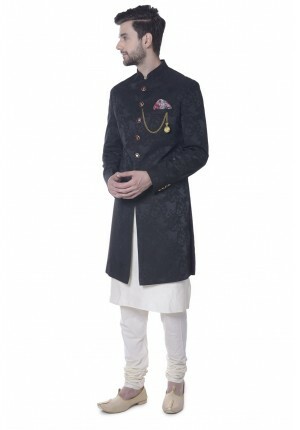 This Black color designer Indowestern made out of banarasi champion fabric with lace detailing at co..
Black designer Indowestern made out of banarasi Champion fabric with matching lace detailing at coll.. 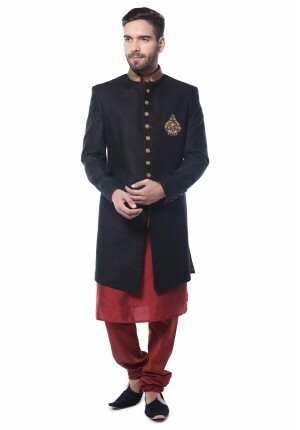 This black indowestern made out of jacquard fabric with printed velvet dupatta given.It comes with k..
A Classic black Indo Western in textured jacquard fabric. 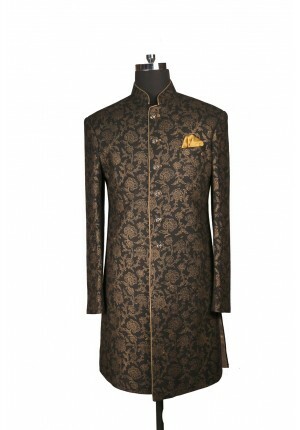 It is enhanced with six golden metallic bu..
Classic black indowestern in textured jacquard fabric. 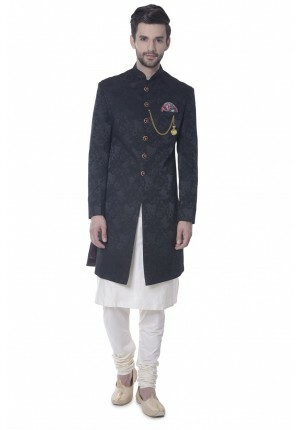 Embellished with royal floral motif me..
A black silk Indowestern with all over antique block print design.It features shimmer piping and lux.. 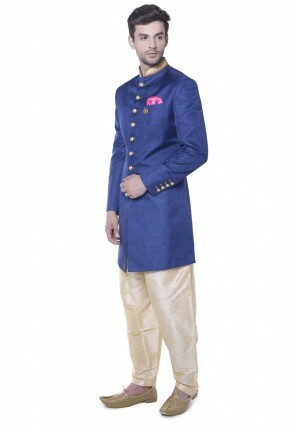 This Blue color designer Indowestern made out of banarasi champion fabric with lace detailing at col..
Blue designer Indowestern made out of banarasi champion fabric with matching lace detailing at colla.. 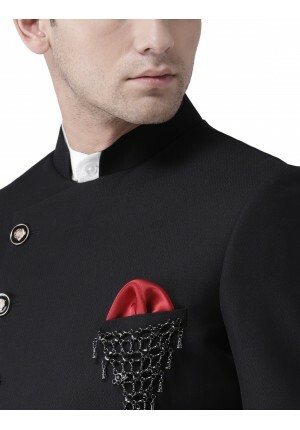 This is a Royal Black Indo Sherwani made in dupion silk fabric. 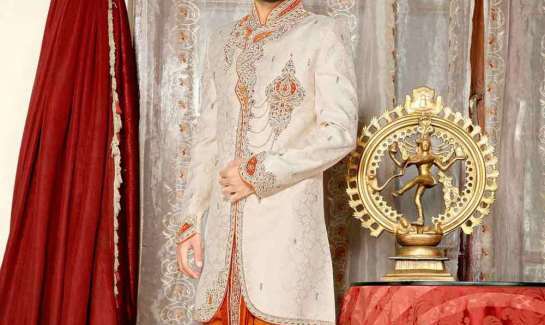 It is embellished with contrast prin.. 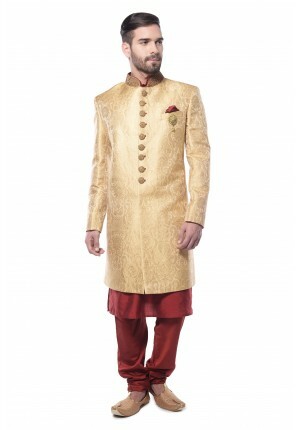 This Beige colour indowestern is crafted from brocade fabric with intricate embroidery in collar and.. 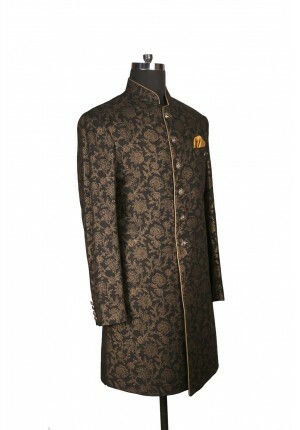 This Nawabi made out of export TR fabric with different cut pattern used at front and maroon machine..